This is a salad which really packs a punch – none of your flimsy lettuce leaves to be seen here. The dressing is similar to a Caesar dressing, hence the name, but I packed it full of garlic, mustard and anchovies to give it as much of a wow factor as possible. 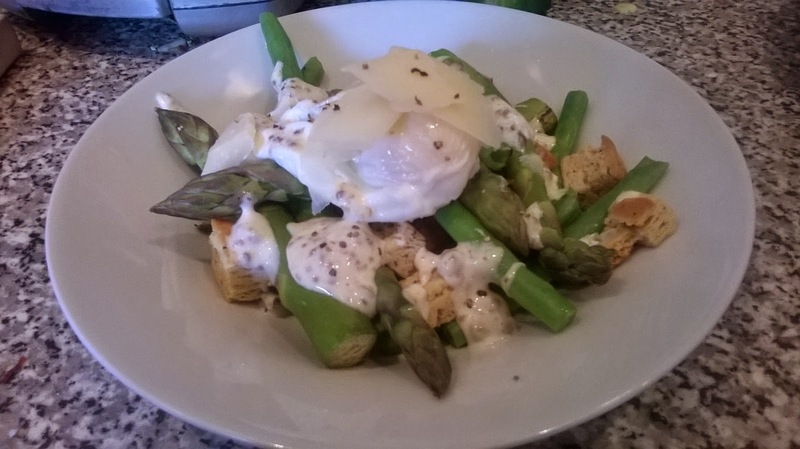 I topped the salad with a poached egg, and this works well with the Caesar dressing too. Then there are all of the different textures – al dente veg, crunchy croutons and silky egg – please give it a go! This recipe makes far more dressing than you’ll need, but it’s great to have in the fridge in case you want something to dip carrot batons (or crisps…) in. As a little postscript – fortunately, this salad goes fantastically well with an ice cold glass of white or a beer, in case you’re indulging/drowning sorrows for the England game. This’ll make enough for 2. 1. Mix together the mayonnaise, mustard and vinegar in bowl. Finely chop your garlic and anchovies and mix in. 2. Put your eggs on to poach – heat a pan of water until it’s boiling rapidly. Crack the eggs in, then turn off the heat and leave for 4-5 minutes. 3. Put a griddle pan on a high heat (you could use a barbeque if you wanted) and add the asparagus and green beans. Heat, turning regularly, until slightly softened and just beginnning to colour. 4. To serve, pile the veg into a bowl and sprinkle over the croutons. Top with your egg, dollop over the sauce and then add your parmesan shavings. Enjoy!